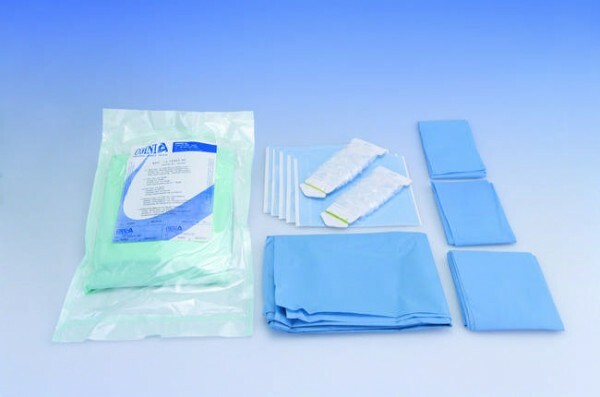 Sterile Set consisting of patient drapes and surface drapes; the set includes handpiece sheaths and adhesive film sheets for handles and keypads. The set is packed in double packing. The convenient detachable label allows easy traceability of the operation. Each set consists of: 1 Absorbent/Waterproof drape 100x150 cm with adhesive U-shaped split* 6.5x30 cm, in light blue NWF+Polyethylene 1 Absorbent/Waterproof drape 75x90 cm, in light blue NWF+Polyethylene 2 Absorbent/Waterproof drapes 50x75 cm, in light blue NWF+Polyethylene 2 Omnisleeve sheaths 120x7 cm, in transparent PVC 4 Film sheets 20x20 cm 2Cross20, in light blue PVC.